We are delighted at the adoption of our last urgent appeal, Ezio, and are hoping that our next boy might have the same luck. As the year draws to a close, we often reflect on the dogs who have been with us the longest, and wonder if this year will bring them the happiness they deserve. 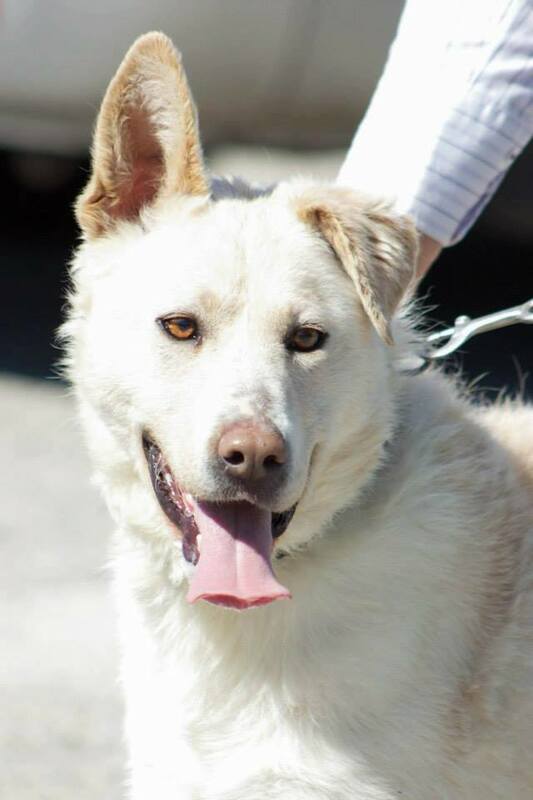 Indy has been at the SPA for almost 2 years, having arrived in February 2015. He is a very handsome boy, and it is surprising that no one has chosen him. Officially he is a labrador/border collie cross, but in reality he is just a medium sized white dog with thick fur, and a joyful personality. Taking him out for a walk always brings smiles. 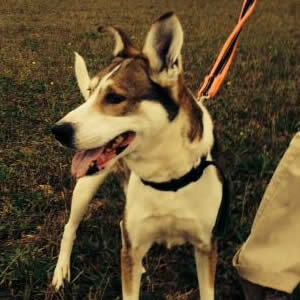 Indy loves to skip along, overjoyed at being out of his kennel and is just full of fun. Indy was born in September 2012, so is still a relatively young dog, but without the craziness of some of our real youngsters. As for the reason he was brought to the SPA? Apparently Indy had attacked some chickens. Having seen how thin he was when he arrived, I am not surprised! We know that Indy chases cats, and although he would prefer to be an only dog, he can walk with other dogs quite happily. Who can offer a home to this lovely boy? More arrivals; it must be the holiday season! ow do you know when it is holiday time in France? Because loads of dogs arrive at the refuges, of course! Yesterday we were shut, but 6 dogs still managed to arrive, and a further 5 today. Where are we expected to put them all? Well, clearly that is our problem; the people who dump them all clearly don’t care a jot. The only person with whom I have any sympathy is the owner of Snoopy, a beautiful dalmatian, who was brought in today. The poor woman has a terminal illness and is unable to look after her dog. She was clearly very ill, and in my opinion this is why the SPA exists, to accept dogs whose owners have a genuine reason for giving them up, not just a change of heart. In any case, Snoopy should find a home easily, as despite being 7 years old, Snoopy is fine with all other dogs and cats. And I know there are lots of fans of this breed out there! It was not all bad news today, as apart from one of the new arrivals whose owner came to get him, there was actually an adoption. Little Ed, has been renamed Elliot, and gone to a lovely new home. The last Elliot we had at the refuge was a magnificent rottweiler. As someone pointed out, the colours are the same, but there is about a 50kg difference in weight between the two! Our wonderful volunteers strike again! No more arrivals today, I am relieved to say, but no departures either. Well, not permanent ones. One of the things that keeps me going when times are rough, is the devotion of the other volunteers. In fact when I say volunteers, quite often I mentally include the employees, several of whom were volunteers before being offered a paid post at the refuge. After all, not only had they already proved their devotion to animals by giving their free time to the refuge, they already knew how things work, so there was no need for extensive training. Several of our volunteers take puppies and kittens home until they have their 2 vaccinations, or just to help with training and socialisation. Other volunteers see a dog in need and offer to foster them, too. On Tuesday little Benson went home to be fattened up, yesterday Megan (she of the staple gun attack) left for some R+R, and today Snoopy the dalmatian left with one of our ex-volunteers/now employees. What is most remarkable about that is that she had a baby boy 3 weeks ago, also has a 3 year old daughter plus 3 dogs and the same number of cats. 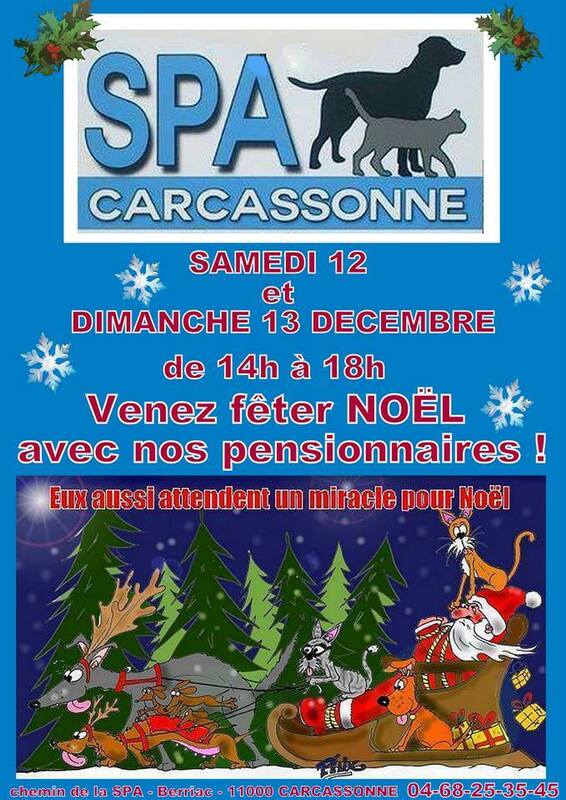 So when I say that the SPA Carcassonne has the best team of volunteers of any refuge, you will know why! In other news the last remaining puppy, from the “flower” litter, Magnolia, has been reserved, and today she met her new big brother, Gibus, who also left the SPA as a puppy (but spent his pre-adoption time with yet another family of volunteers!) Here is a photo of him today; some of you may remember him from when he was little! Can I just also add a PS: Like everyone who works in animal rescue, I am incredibly busy. Please can you decide whether you do actually want to adopt a dog (and have the permission of your children if required) before making me spend my precious time jumping through hoops answering your questions. I have little enough free time as it is. À bon entendeur salut, as they say in these parts! Two beautiful new girls who need us! Not such a great day today, with two new dogs arriving. However once you see how thin these two beautiful girls are, perhaps you agree with me, that their arrival is in fact good news. Now they are at the SPA, Sylphide and Sveltesse will be given regular high quality food, veterinary treatment and lots of love. I spent some time in their kennel with them this afternoon, and I was rewarded with several little delicate licks, as they learned that no harm would befall them, and that they are safe and loved. As I have seen the numerous hunt dogs that are rejected at the end of each season, I have found myself drawn ever more towards this type of dog. They make wonderful family pets and they have a special something that just touches my heart. However long these two spend at the refuge, I am sure it is the best life they will have ever known. So welcome to both of them! Not only have we had wonderful news, photos and even video of the 5 dogs, who are now safely and happily installed in Animal Trust, we have also had a couple of adoptions today. Little Sadie, another invisible dog, left for her new home. She had no education at all, as several volunteers know all too well. But that didn’t stop her from catching someone’s eye and she is going to be a very happy dog, as we know some very good friends of Sadie’s new owners. They came along to collect her today and left with a new dog of their own; Bianca! This was just the icing on the cake for me. The only entry today was an eight month old chihuahua, who weighs 2 kg and is presumably just lost (tho strangely he is not identified). So today was officially a GOOD DAY! Here are photos of Sadie and Bianca, and I hope you can follow the link to three of our dogs playing at Animal Trust. And a video to warm the cockles of your heart!